In December I was inspired to work towards Vishvamitrasana. This posture has a lot happening at once: it's an arm balance, a huge side body stretch, shoulder opener, torso twist, hamstring opener, and hip flexor stretch all-in-one. After all is said and done, I wasn't able to make it into full Visvamitrasana (named after the sage Visvamitra), but ardha Visvamitrasana which I'm still pretty happy with. Compass/sundial, Parivritta surya yantrasana. Holy hamstrings! To start off over this month long series, I, alongside my students, worked towards Compass. Compass is a seated posture in which all of the above I previously mentioned are still at play. Being seated, you have a little more leverage to twist so you can broaden through your chest and get your shoulder under your arm, while still extending through your leg. In a seated posture, choose a side first. For the purposes of explaining this posture, I'll go with the right. Bend into your left knee, with your sole as close to your groin. With your right hand, place it in front of your inner right thigh. Firmly press into your mat, or the floor with your right hand as your take your left hand to grab for the baby toe edge of your right foot. If this is already challenging, you can use a strap as an extension of your left hand to loop around the ball mound of your right foot. From here, kick your right foot into your left hand as you bring your chest up and under your left tricep. You will be twisting from your torso as you feel a side body stretch along your left ribcage. Bring your gaze from under your left tricep towards the ceiling and press your right tricep into your right inner thigh. Voila! After working on compass for a bit, I moved on to reclined flying warrior, supta visvamitrasana. This posture still demands a lot of your hamstrings and hips, but takes the standing balance component from visvamitrasana out of it. Think of it as compass pose, but flipped on its side with the bottom leg extended. I'll start off with the right side again. Lay down on your right side as if you were hanging out at the park or beach, with your right forearm flat on the ground. Extend your right leg straight under you and keep your leg engaged by flexing your toes towards your face. Your left arm will be laying on top of you, so place your left palm flat on the floor and firmly press all fingertips into the ground. As we did with compass, bend your left knee towards your chest so you can reach for the baby toe edge of your left foot. Kick into your right hand and stay there, or continue to extend through your left leg as you use that as leverage to bring your shoulder before your left thigh. Your left hand will act as a safety bumper so you don't fall over. 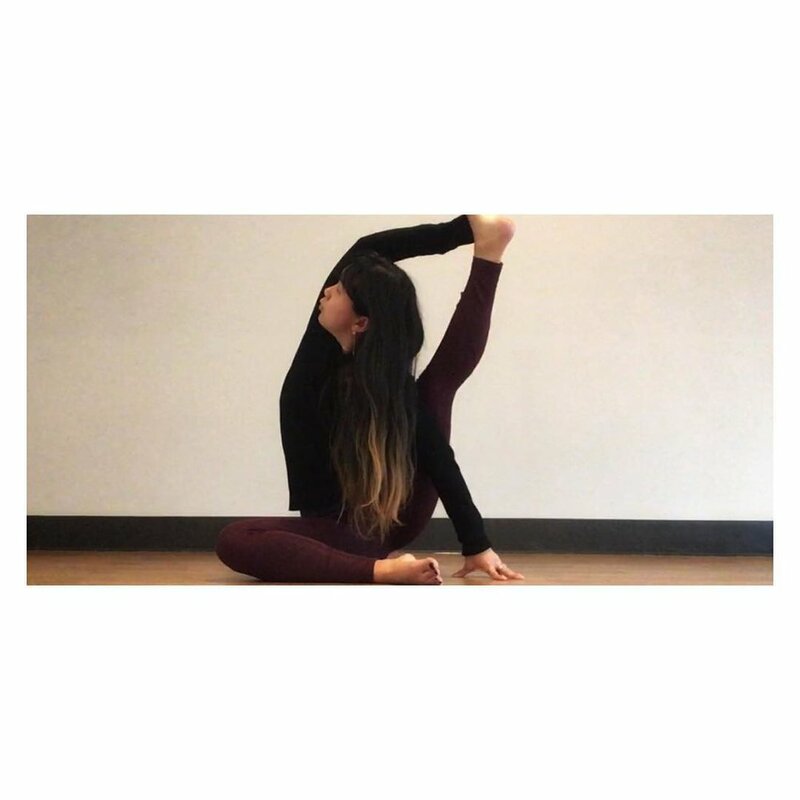 To progress further, visvamitrasana adds all components together (remember, arm balance, a huge side body stretch, shoulder opener, torso twist, hamstring opener, and hip flexor stretch...holy sh!t). Again, for the purposes of explaining, I'll do the right side. Start out in a low lunge (right foot forward) with your back knee lifted and back foot flat in about two to three inches closer than you normally would. Shimmy your right shoulder under your right thigh, and press your right hand into the floor outside of your right foot so much that your right heel starts to lift. Once you feel stable, reach up and over with your left hand to grab for the baby toe edge of your right foot (again, feel free to utilize a strap). Start to kick your right foot into your left hand as your extend through your right leg. Test your balance and hip/hamstring openness by staying with your left leg lifted, or lower down to your left knee as you see me doing. From here, see if you can keep your chest lifted with your heart up towards the sky and twist from your torso to bring your left tricep behind your head. If it's okay with your neck, bring your gaze up and continue to press your right tricep into your right inner thigh. Visvamitrasana is not easy, nor are the prep postures, so don't feel like you aren't the best yogi if you cannot get into them. One of my goals for 2018 is to increase flexibility and openness in my hamstrings and hips, so I'm right there with you. Let me know how your practice goes and I'm here if you have any questions or need guidance on your practice!